I may have the TC-50 that has taken me away from enjoying my other amps. Four of which are under wraps and have not been heated up for a while. 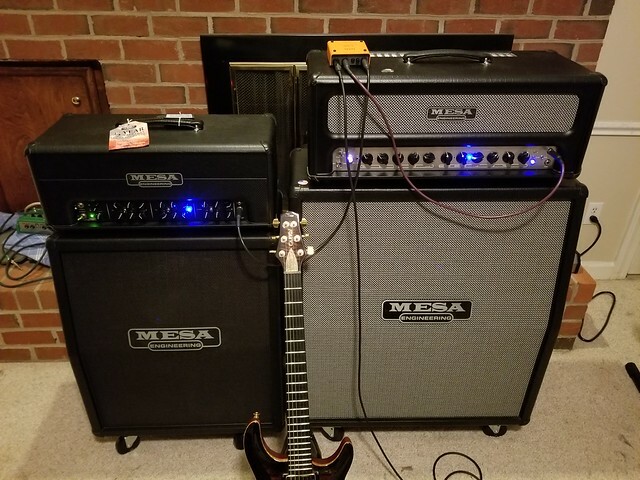 RA100 half stack, RA100 combo, Roadster half stack and the JP-2C. The Mark V had been revitalized with NOS Beijing 12AX7A tubes along with the 12AT7 V4 swap. An of course the TC-50. I have not forgotten of my other favorites and the RA100 is one of them. Actually they all are so I enjoy each amp equally. There is something about the RA100 that rings out above the rest, clean channel with a moderately high gain setting. I cannot get the same characteristic and tone with my other amps (TC-50 included, yeah similar preamp but how it drives the power tubes is a bit different). It even gets sweeter with the multi-soak set to -4dB. Or switch over to 50W and just have a blast. I have discovered the ideal preamp tube arrangement that meets my desires. I had posted it somewhere but cannot quite remember what I used.... but it is something like this....V1 = Mullard medium plate CV4004, V2 = Mullard long plate Re-issue 12AX7, V3 = stock mesa 12AT7, V4 = Mullard medium plate CV4004, V5 = Svetlana 12AX7, V6 = stock tube, V7 = Sovtek LPS. Power tubes are SED =C= EL34. I do have a pair of the Mesa NOS Siemens EL34 tubes and I may get another pair to replace the SED =C=EL34 when their time is due for replacement. I have not tried them in the RA100 yet as I only have one pair. The long plate tube in V2 aids in some high frequency roll off which balances out the tone on the Hi gain setting as well as the lo gain setting, also this tube position drives the tone stack. The CV4004 is similar to the Tung Sol 12AX7 in some respects but different in others as (depending on what amp you use it in and where it is placed). Also the Tung Sol has a similar effect in V1 in this amp especially with the Vintage Hi gain channel. For the clean channel the Mullard CV4004 tightens up the bottom end a bit for the 1st and 2nd gain stage V4 position. It really does not make much of a difference what is in V5. Other tubes can make a difference as well. The old stock Mesa tubes I have (same as the Beijing NOS tubes ) also have merit for use in the RA100. Yes they are fizzy in the older Mark series amps prior to the Mark III but they sound great in the Mark V, Roadster, and the RA100 and no fizz. The RA100 may not respond as dramatically as the Mark V with different preamp tubes but it can be tuned to some extent such that you will notice the difference. After having fun with the preamp and power tube cocktail in the RA100, I have been thinking can it be done with the TC-50 (much easier to carry head wise). I have not yet explored the potential of the TC-50 in terms of preamp tube changes. It is a descendant of the RA100 and Dyne. If I come across an Electra Dyne for sale I may pick it up as I had played though one when my heart was set on the RA100. bandit2013 wrote: If I come across an Electra Dyne for sale I may pick it up as I had played though one when my heart was set on the RA100. I have not been able to find a Dyne local. So I can hold off on that for a while. Lately I have put the Mark V and JP-2C aside as I am focusing more on the RA100. It is a bit looser on the bottom compared to the TC-50 but still the RA100 is king for the tone I am after. I enjoy playing through the RA100 just as much as I do with the JP-2C. Still the JP-2C is amazing on how it cleans up with reduced guitar volume and yet remains at the same output level. RA100 is close but at the same time you get a volume drop. I may get the optical compressor pedal out and see if I can retain some volume level with a reduction in guitar volume. That volume roll off on guitar seems to effect the TC-50 more than the RA. There is something about the Royal that just keeps me coming back to it. Even set to 50W it is awesome. Too bad Mesa shuffled this amp under the carpet so soon. At least they have the TC-100 out now. I am sure that amp rocks and I was considering getting it but I have two RA100's. I have considered getting a JVM410JS or what ever the model number is. If I were to jump ship and take aim at a Marshall, the quality better be there for the cost factor. That is probably one reason I have more Mesa amps than other brands. Quality and workmanship is one thing but feel of the product is another. Control pots just seem precise and not cheesy. The Vinyl covering is tops, Cabinet construction is great and the parts used are of better quality than the competition. If I was really sick in the head, I would invest in an exotic wood enclosure. Actually if I did that, it would limit how many of the amps I would be able to have so the exotic wood thing is not as important to me, would rather leave that for the guitar it self. Do I opt for the TC-100..... If I do then what? In the fence on that issue. Sure the options and features are great but I like the simple look of the RA100 too. No harm in having both I would assume. I was checking out the video's on Sweetwater website on the TC-100. May have to get one. Sounds great in recordings. One thing that is hard to beat when it comes to the RA100. Running this amp at 50W parallel to the TC-50. As it appears, the phase relationship between the two clean channels, Lo channels, and Hi channels are the same. I am using a Lehle P-split 2 to connect both amps. That little device works extremely well. I have also used it in the loop and slaved one amp or the other just to hear the difference in preamp. The TC is voiced just a bit differently than the RA preamp but in most respects they sound the same. What may separate the two preamps would be plate voltages and other circuitry (Cathode bypass caps and such). I have not opened both up to compare components or measure voltage differences as I did not think that was necessary. What does sound incredibly awesome is running the two slightly different amps in parallel. Having one on a 412 and the other on a vertical 212 does add some differences in tone. What makes it more spectacular is to use the phase switch on the Lehle P-split 2. Having the amps out of phase deepens the stereo effect and seems to add in some ambience. Running both amps on the clean channel (TC in drive setting) and push the gain on both, (of course adjusting the bass control to reduce the dominance of the clean channel) just sings AC/DC. Back in black, Whole lotta Rosie, TNT, and Hell's Bells never sounded better. Trick with AC/DC is not to have too much gain but just enough to saturate (have to think plexi). I can get the vintage Lo and CH2 to do the same thing. I cannot say enough how much I love the clean channel on both the RA100 and TC-50 especially with boosted gain settings. I posted this image in the TC-50 forum on a similar subject.... here it is again on this thread as I have not been posting in here all that much. Do I want the TC-100, heck yea. That would pair up with the RA100 a bit better when using 100W power setting. the attenuator or multi-soak may be different but I rarely ever use it all that much. Last night I was using the TC-50 as a wet rig (put a delay in the loop) which really made things quite interesting. Never tried that before. Coupled with the phased shifted stereo effect just completed the sound. I was playing other songs and different styles and not limited to the clean channels.